Guash Fishing Club – A long-established club with over 16 miles of mostly double-bank fishing on the River Guash and the River Welland. 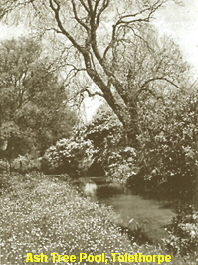 The Guash Fishing Club was formed in 1921 by Major Bailey, the estate manager of Burghley Estate through whose land the river flowed. 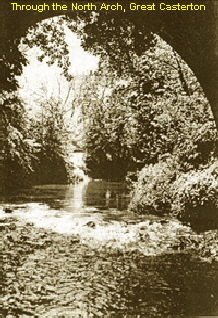 For 70 or more years the Guash was the only river the club fished but in 1996 the club acquired fishing on the River Welland and now has 3 beats on the river at Harringworth, Hudds Mill, and Uffington. In total the club has access to over 16 miles of mostly double bank fishing. There are now over 100 members all dedicated to river fishing and the challenges that it offers. The River Guash or Gwash (the u is an ancient spelling) is a small limestone trout stream that runs in the valley from Braunston-in-Rutland to where it joins the Welland just downstream of Stamford. Since the early 70s Rutland Water has intercepted the river and it flows into the lake at its western end and is released, somewhat depleted, at Empingham. However, the release from Rutland is constant so while we don’t get winter floods we always have a constant flow in the summer. In addition the North Brook joins the river at Empingham. The water is exceptionally clean and the stream scores very highly on the Environment Agency aquatic invertebrate assessments. Brown trout are the dominant fish species but there are grayling dace and chub lower down the river with the occasional rainbow escapee. 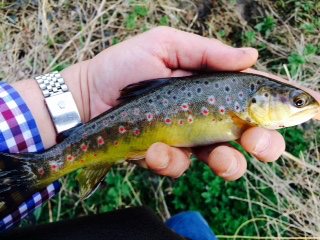 The Club stopped stocking trout in 2002 and this has led to an increase in the size of the wild fish and fish of 1lb are not uncommon and recently a 3lb fish was taken. The fish are free rising and there is a good hatch of Mayfly and other ephemeroptera through the season. The fishing is challenging though owing to the wildness of the fish, often in shallow water with bank-side trees and bushes willing to grab your fly before the fish does. With the aid of the Environment Agency the club has made major award-winning improvements to several sections of the river and the Club continues this work when funding support is available. And moss and ivy speckling on my eye. The River Welland is a much more substantial river and whilst the Guash can be guaranteed to be clear and fishable the Welland can flood spectacularly. The river is stocked every year with brown trout. The beats the club fishes are very different in nature. The Upper Welland at Harringworth in Northamptonshire is a small river at summer levels with some nice riffles and deeply scoured pools, an abundance of minnows ensures the trout grow well and the record on this beat is just under 4lbs. There are wild fish but this beat is stocked. The Mayfly hatch can be very prolific. Otters are frequently seen here. Again we have benefited from EA work in developing new riffles, pools and bank conservation. The Lower Welland at Uffington is in Lincolnshire and the river here is wider with a gravel bed, very reminiscent of a chalk stream. This beat can fish well and has produced some very large trout in recent seasons notably one of 5lbs 2ozs. There is an excellent Mayfly hatch and sedges are found in abundance. Coarse fishing is available on the Welland in the trout close season and grayling fishing on both the Welland and Guash.